Do you remember Shrink Dinks? I had forgotten all about them until I ran across the Klutz Press book on them, which of course I bought, and then proceeded to store away for years with my art supplies. Well, today is the day they finally got put to use. I used about 1/3 of a sheet for these guys, and wow, they got soooo wee. Seriously, I was somehow not expecting them to shrink quite so much, but I have future wicked plans for making more. Here you can see them with a dime for size comparison — on my screen, they’re actually larger than they are in real life. Dark-colored Sharpies are still quite dark on the semi-transparent plastic, though you can see the colors clearly above with the lights shining through. I’m definitely going to have to experiment with some more of these, and then figure out how to price them and what for. 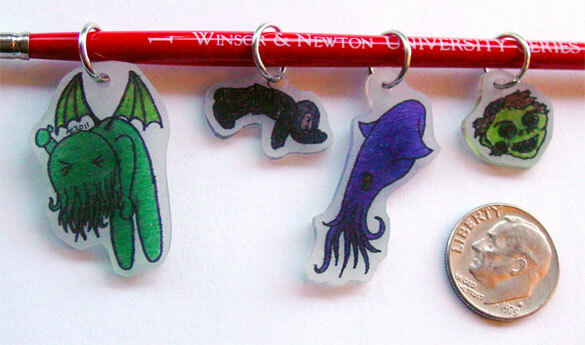 Perhaps a set of ninja stitch markers? Zombie zipper pulls? Cthulhu on a cord for a necklace? these turned out adorable! i could see little weebley necklaces, like cartoon kristine all tiny to put on a chain? tee hee! Hee, yes! That would be adorable. Thanks! They would make neat earrings too. I was thinking of that, though the jump rings are pretty big so I might need to get some smaller (plus earring findings). I have 10+ sheets of the stuff, so, more experiments soon!